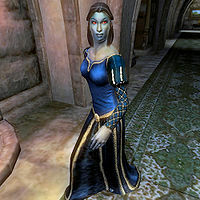 Ulene Hlervu is a Dunmer healer serving as castle mage in Cheydinhal. Speaking with her about her city of choice will not only add a map marker for Azura's Shrine, it will also cause numerous Cyrodiil citizens to talk about daedric shrines and daedric cults. She lives a rather isolated existence in the restricted areas of the castle, but will venture out every day, presumed it is not raining. She sleeps in the private quarters of the castle every night between midnight and 6am. After waking up she strolls around until noon. If the weather is clear she then leaves the castle for a bit of sightseeing in downtown Cheydinhal, starting on Peachtree Island between Willow Bank and Riverview. At 4pm she moves on, and strolls around in the business district between the local Fighters Guild and the Cheydinhal Bridge Inn. At 6pm she returns to the castle and her quarters, wandering around until she participates in the formal dinner in the great hall until her bedtime at midnight. She wears a blue velvet outfit with a pair of blue suede shoes. She carries the Cheydinhal Castle interior and exterior keys as well as a large amount of gold. Ulene has the ability to use a leveled set of healer spells, as well as one extra major Restoration spell. When you meet her for the first time, you will get a rather odd greeting: "I'm Ulene Hlervu, Castle Mage. Perhaps you've been warned off me as a scandalous, blasphemous scoffer and cynic. The characterization is completely accurate. I despise the gods and those who bow before them." If you ask Ulene about Cheydinhal, she will respond: "You worship the Nine Divines, perhaps? Have they ever helped or harmed you? Of course not. Now, worship a Daedra Lord, and you get effects... bad ones, of course, but clear and measurable effects." After these words, a Daedra shrines conversation topic will be available in her dialogue options. When you speak to Ulene about this topic, she will mark Azura's Shrine on your map with the words: "The Azura coven in the Jeralls north of Cheydinhal... nice folks. Nothing like the blood-drinking Daedra worshippers everyone raves about. A waste of time, of course, worshipping gods in the first place. But at least they're not raving lunatics." An important side-effect of asking Ulene about Cheydinhal is that it adds the Daedra shrines and Daedra cults dialogue topics to several people in Cyrodiil, who will all add markers for undiscovered Daedric Shrines to your map. See this page for a complete list of affected NPCs. This page was last modified on 27 March 2013, at 22:21.